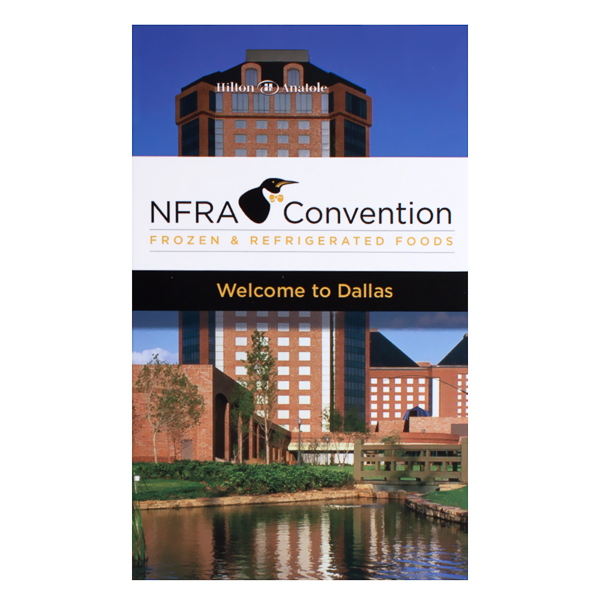 The National Frozen & Refrigerated Foods Convention's cover features a photo of the Dallas Hilton where the 2015 event took place. Bright yellow accents on the pocket and event schedule warm the gray inner panels with a sunny, inviting look. On the back, recipients can scan a QR code to download the convention app and make navigating the multi-day event a breeze. 3 foil stamped areas on Side 1 of uncoated 80lb Gray Fiber stock. 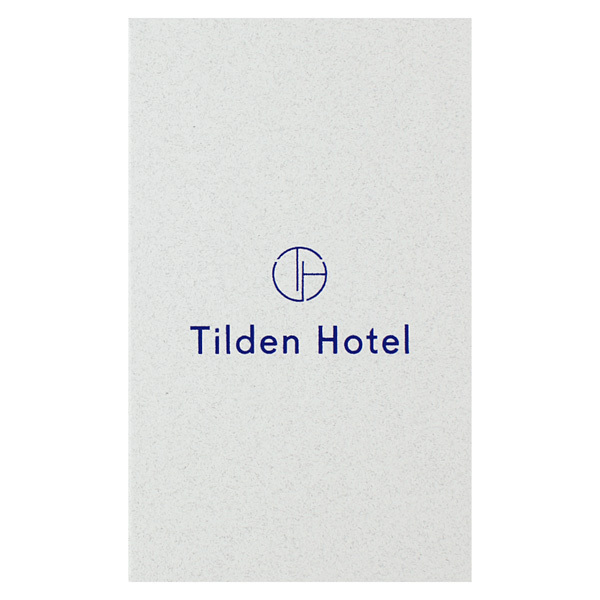 San Francisco's Tilden Hotel offers a minimalistic guest experience in a thriving downtown area—hence this bare bones design. Flecked Gray Fiber stock resembles mist hovering over the Bay. Non-Metallic Navy foil adds a cool, smooth sheen and a nondescript color. The single pocket bears a blank line for the room number, while contact info on the back cover helps guests return to the hotel when they're done sightseeing. 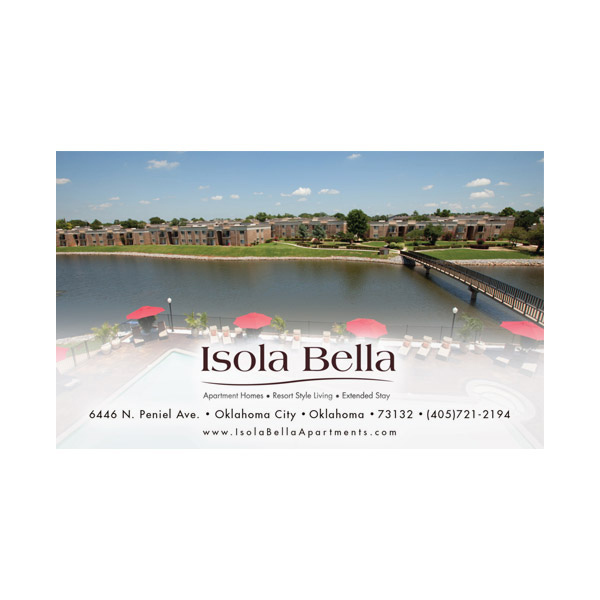 A scenic cover photo invites visitors to enjoy an extended stay at Isola Bella's waterfront apartments. Sunny blue skies and pink umbrellas on the pool patio welcome guests with a bright, cheery attitude. An opaque white box holds the complex's name and contact information. The interior left panel offers community info, from gym hours to mealtimes to the apartment's Wi-Fi code. A large curved pocket holds guests' room keys. Emergency numbers on the back give guests 24-hour access to maintenance, courtesy patrol, and an attendant. LHotel Montreal's grand entrance transfixes guests twice: once when they arrive and again when they receive the key to their lavish room. 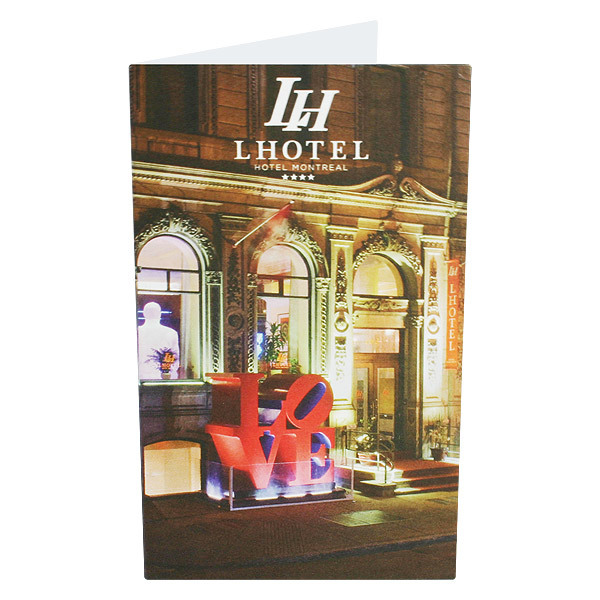 Lit up at night, the hotel radiates a sense of mystique captured on this card holder. Once guests peruse the museum's art gallery, a map on the inner panels guides them into the streets of Quebec's Old Montreal, where they can appreciate the city's architectural history. On the pocket, bilingual name and room labels celebrate Montreal's unique blend of English and French language and culture. The perfect fit for gift cards, hotel keys, or other media up to 2 1/2" x 4 1/4" in size, the curved interior pocket both secures cards and brings a touch of class and sophistication to your design. Taller than its straight-edged counterparts, the 3" pocket offers extra coverage to protect its contents, yet the gentle slope of the curve offers a tantalizing view of the card's left side. With its portrait orientation, the left panel provides a space to include helpful information—your business' history, a list of amenities at your hotel or resort, or even a map of local areas.